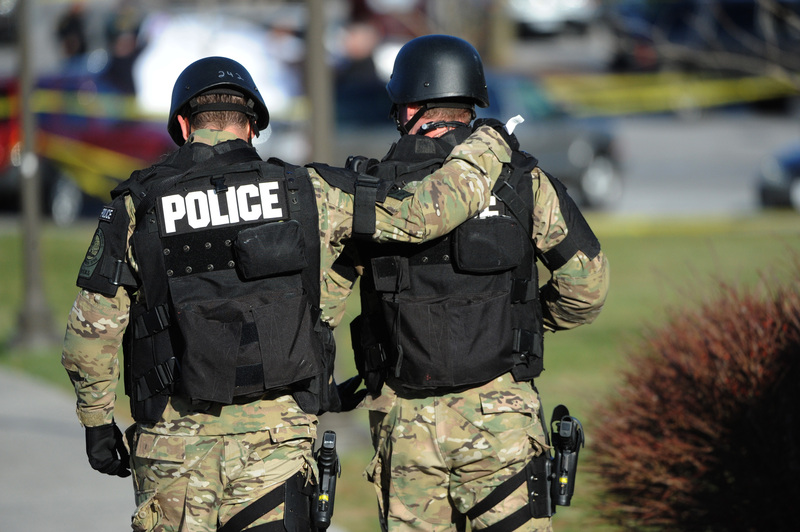 BLACKSBURG, Va. - A gunman killed a police officer in a Virginia Tech parking lot Thursday and then apparently shot himself to death nearby in a baffling attack that shook up the campus nearly five years after it was the scene of the deadliest shooting rampage in modern U.S. history. The shooting took place on the same day Virginia Tech officials were in Washington, fighting a government fine over their alleged mishandling of the 2007 bloodbath where 33 people were killed. Before it became clear that the gunman in Thursday's attack was dead, the school applied the lessons learned during the last tragedy, locking down the campus and using a high-tech alert system to warn students and faculty members to stay indoors. "In light of the turmoil and trauma and the tragedy suffered by this campus by guns, I can only say words don't describe our feelings and they're elusive at this point in time," university president Charles Steger said. "Our hearts are broken again for the family of our police officer." The officer was killed after pulling a driver over in a traffic stop. The gunman  who was not involved in the traffic stop  walked into the parking lot and ambushed the officer. Police did not know what the motive was. The officer was identified as Deriek W. Crouse, a 39-year-old Army veteran and married father of five who joined the campus police force about six months after the 2007 massacre, the school said. He previously worked at a jail and a sheriff's department. A law enforcement official who spoke on the condition of anonymity confirmed the gunman was dead, but wouldn't say how he died. While authorities wouldn't confirm specific details about the gunman, they released a timeline of events. At about 12:15 p.m., the officer called in the traffic stop. After a few minutes passed without hearing from the officer, dispatch tried to get in touch with him, but didn't get a response. About 15 minutes later, police received the first call from a witness who said an officer had been shot at the Cassell Coliseum parking lot and the gunman had fled on foot. Local, state and federal officials responded immediately. At 1 p.m., an officer saw a suspicious man in a parking lot known as The Cage. The man had a gunshot wound and a gun was nearby. Authorities said they responded to numerous other calls of suspicious activity, but found that there were no other threats and lifted the campus lockdown, about four hours after the initial alerts. Asked if police were still looking for the shooter, state police Sgt. Robert Carpentieri said: "I think the investigators feel confident that we've located the person. I can't give you specifics and I don't want to confirm that but you can kind of read between the lines so I won't specifically address that question." The officer, who wasn't immediately identified, had served on the campus police force for four years. State police were still investigating whether he had been specifically targeted. The campus force has about 50 officers and 20 full- and part-time security guards. At the time of the shootings, students were preparing for exams when they were suddenly told to hunker down. Heavily armed officers swarmed the campus as caravans of SWAT vehicles and other police cars with emergency lights flashing patrolled nearby. "A lot of people, especially toward the beginning were scared," said Jared Brumfield, a 19-year-old freshman from Culpeper, Va., who was locked in the Squires Student Center since around 1:30 p.m. "A lot of people are loosening up now. I guess we're just waiting it out, waiting for it to be over." The university sent updates about every 30 minutes, regardless of whether they had any new information, school spokesman Mark Owczarski said. "It's crazy that someone would go and do something like that with all the stuff that happened in 2007," said Corey Smith, a 19-year-old sophomore from Mechanicsville, Va., who was headed to a dining hall near the site of one of the shootings. He told The Associated Press that he stayed inside after seeing the alerts from the school. "It's just weird to think about why someone would do something like this when the school's had so many problems," Smith said. Harry White, 20, a junior physics major, said he was in line for a sandwich at a restaurant in a campus building when he received the text message alert. White said he didn't panic, thinking instead about a false alarm about a possible gunman that locked down the campus in August. White used an indoor walkway to go to a computer lab in an adjacent building, where he checked news reports. "I decided to just check to see how serious it was. I saw it's actually someone shooting someone, not something false, something that looks like a gun," White said. Campus was quieter than usual because classes ended Wednesday and students were preparing for exams, which were to begin Friday. The school postponed those tests. CBS affiliate WDBJ Roanoke reported that a candlelight vigil will be held at Virginia Tech on Friday at 6:30 p.m. The shooting came soon after the conclusion of a hearing where Virginia Tech was appealing a $55,000 fine by the U.S. Education Department in connection with the university's response to the 2007 rampage. The department said the school violated the law by waiting more than two hours after two students were shot to death in their dorm before sending an email warning. By then, student gunman Seung-Hui Cho was chaining the doors to a classroom building where he killed 30 more people and then himself. The department said the email was too vague because it mentioned only a "shooting incident," not the deaths. During testimony Thursday, the university's police chief, Wendell Flinchum, said there were no immediate signs in the dorm to indicate a threat to the campus. He said the shootings were believed to be an isolated domestic incident and that the shooter had fled. An administrative judge ended the hearing by asking each side to submit a brief by the end of January. It is unclear when he will rule. Since the massacre, the school expanded its emergency notification systems. Alerts now go out by electronic message boards in classrooms, by text messages and other methods. Other colleges and universities have put in place similar systems. Universities are required under the Clery Act to provide warnings in a timely manner and to report the number of crimes on campus. During about a one-hour period on Thursday, the university issued four separate alerts. Derek O'Dell, a third-year veterinary student at Virginia Tech who was wounded in the 2007 shooting, was shaken. "It just brings up a lot of bad feelings, bad memories," O'Dell said. "You pray there are no more victims, and pray for the families." O'Dell was monitoring the situation from his home a couple of miles from campus. "At first I was just hoping it was a false alarm," he said. "Then there were reports of two people dead, and the second person shot was in the parking lot where I usually park to go to school so it was kind of surreal." In August, a report of a possible gunman at Virginia Tech set off the longest, most extensive lockdown and search on campus since 2007. No gunman was found, and the school gave the all-clear about five hours after sirens began wailing and students and staff members started receiving warnings. The system was also put to the test in 2008, when an exploding nail gun cartridge was mistaken for gunfire. Only one dorm was locked down during that emergency, and it reopened two hours later.